Richard Branson, the jetsetting Virgin Group business bigwig, has offered theoretical physicist Stephen Hawking the opportunity of a lifetime: a free ride to space. "Richard Branson has offered me a seat on Virgin Galactic," the acclaimed astrophysicist explained on an interview with Good Morning Britain. Obviously Hawking reacted the way any sane human -- let alone someone who's made it his career to study our place in the universe -- would react: "And I said yes immediately." Branson, a rich guy with terrific hair and even better teeth who kitesurfs with Obama sometimes, has been building toward a dream of commercialized spaceflight for several years now. He initially hoped to get the first Virgin Galactic shuttle in the air as early as 2009, but explosions and other disasters have pushed that timeline back quite a bit. Who woulda thunk that shooting humans into space could be such a difficult business enterprise? Hawking's a guy who's smart enough to know the risks however. The 75-year-old has written several books on humanity's place in space, has defended a theory that we live in a multiverse with alternate realities, crafted theories about quantum mechanics most of us can't comprehend, and earned the Presidential Medal of Freedom for his achievements in science, and for years has been celebrated as an authority in cosmology. 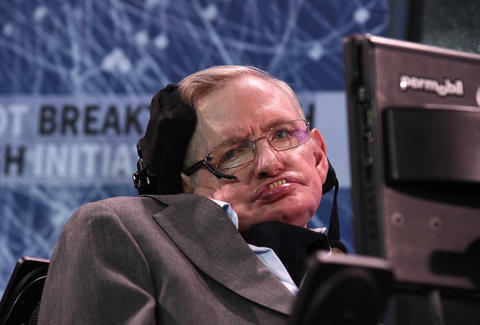 Despite being paralyzed for the last several decades by a rare form of ALS, requiring him to communicate and speak through a computer, Hawking has dreamed of space travel his entire life. In the same interview, which covered topics ranging from Brexit and Donald Trump to a reflection on his own happiness, he said that his "three children have brought me great joy -- and I can tell you what will make me happy, to travel in space." And Hawking's not wasting any time: "I have already completed a zero-gravity flight which allowed me to float, weightless." Eric Vilas-Boas is a writer and editor at Thrillist.